If you're reading this (and apparently you are), you probably already know a thing or two about bromeliads. For example, you probably know that most of them are grown for their pretty spectacular flowers1. You might know that most of them are epiphytes, and grow on tree branches in the wild, not in soil. You probably know that pineapples are bromeliads, and that they're one of the exceptions to the epiphyte thing. But you may not already be aware that they're also a convenient place for some creatures to lay their eggs. The center of the plant collects rainwater, and also organic debris from higher up in the tree (dead insects, bird droppings, fallen leaves), which serves as a stable supply of water and fertilizer for the growing plant. Mosquitoes need stable pools of water in which to lay eggs, so bromeliads are a natural and convenient place for them to go. (Sometimes, apparently, they hover over the water and drop eggs in from above, even.) Certain kinds of mosquitoes apparently don't lay eggs anywhere else. Some beetles do likewise. Frogs, too, need water for their tadpoles, and the best kind of water, from a frog's perspective, is water that's not already full of tadpole-eating fish and other predators. So they join up, too. 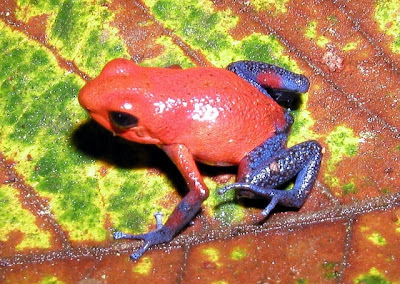 The brightly-colored poison arrow frogs are the most famous tenants, but there are others. The strawberry poison-dart frog, Oophaga pumilio, "blue jeans" morph. But don't go thinking that this sort of thing only happens in the wild. Here is a video describing a bromeliad-facilitated invasion of tree frogs ( Eleutherodactylus coqui, common name "coquí:" it's native to Puerto Rico but has spread to other areas, and has become a severe invasive pest in Hawaii2) in the biology department greenhouse at the University of Massachusetts in Boston. I advise my readers to skip the comments. 3 The high point of the video for our purposes is the part where the greenhouse manager shows the camera an Aechmea fasciata in some detail. Special thanks to the Invasive Species Weblog, kept by Dr. Jennifer Foreman Orth, for linking to the video in the first place. You'll be seeing plenty of links to ISW in the future. Why? Because it's important. But should I say something about the plant itself? I probably should. Well, they're great, actually. It's difficult to find one in stores that's not in bloom (though we have some at work right now), and that's a complication, because they die after flowering. The dying can take over a year, though (I've had my mother plant for almost exactly a year, and it's still very much alive, still kicking out offsets, though I killed the last two, alas. The one pictured above is an offset, or "pup," from the one I bought. I don't know how long it had been in the store, in flower, when I bought it, but I know it was at least three months, and very probably six), during which time it will offset. Pups can be removed and planted up by themselves when they're of substantial size (the rule of thumb I usually see is, they can be removed when they're about one-third the height of the mother: I don't know whether this is actually a hard and fast rule or if it's just something people say.). Precisely how many pups a plant may produce before it kicks is variable, but my Aechmea fasciata has thus far tried three times, with a fourth in progress at the moment. Care is a piece of cake, though. Light: The books say bright indirect light with no sun; mine haven't seemed to mind some filtered sunlight. Feeding: Feeding is a bit tricky, in that feeding is generally done directly into the vase ('cause, remember, you're trying to imitate tadpole poop) at greatly reduced strength. Feeding the roots is fine, too, and foliar feeding (spraying a fertilizer solution directly onto leaves) is also popular. However you do it, remember to go easy on the feeding. We're trying to simulate tadpole poop, not elephant poop. More is not better. 4 Aechmea does have a higher than standard requirement for magnesium, though this is probably not worth going out of your way to supplement, if you're growing a plant at home for your own enjoyment. Water: The vase does not have to be full of water at all times, and in fact some growers advise against putting water in there ever, in interior situations. If you do keep water in it, remember to rinse it periodically, to keep mineral deposits, fertilizer, algae, etc., from building up and disfiguring the leaves. I personally do keep water in the vase of my plants . . . when I remember to. They don’t seem to notice whether I do or don't. Soil: Use a barky, woody mix, with osmunda fiber and perlite or sphagnum or something in there that can hold some water. But there's no need to get carried away with the specialness of the occasion. My own plants are in the usual potting mix I use for everything; lots of perlite in a peaty kind of Miracle Gro base, with random bits of other stuff (sand, bark, gravel) floating around in there. It's not good for starting offsets, I've learned the hard way (too wet, not enough roots), and wouldn't actually be what I'd recommend for other people to use, but since the plants seem happy, I'm not inclined to make any drastic changes. If and when I need to repot, or when I take off that fourth offset, I might change the soil, though, having recently had the importance of good soil impressed upon me. 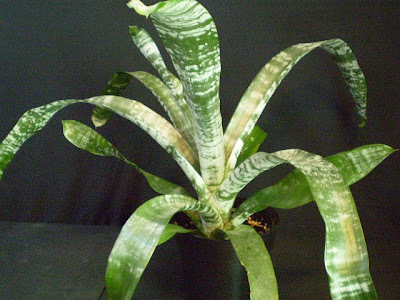 Temperature: The books advise against letting Aechmea fasciata go below 50ºF (10ºC); cold will cause dead spots to form on leaves and other kinds of badness. If all that sounds complicated, it's really not that bad. Getting a plant to bloom is sort of a circus, potentially, and I don't really want to get into it here and now, but it should be mostly a matter of time. Plants are generally ready to flower when they're about three years old, though they may or may not do so. Growers have ways to force flowers early, when plants are about a year and a half old, but this isn't really practical for home growers. And besides, what's your hurry? 2 If this seems familiar, it's because we've seen it before. I kind of get the impression that it's always a bad idea to bring a new species to Hawaii. 4 More is almost never better. Err on the side of starving your plants, as a rule. Too much food will cause bizarre growth, dead roots, burned leaf tips, and other problems, like death. That strawberry poison-dart frog is sure a strange looking creature. It doesn't even look real with that odd coloring. Reminds me of one of those floppy plastic frogs from China that little boys put in their sister's rooms to scare them. The impression I get from the Wikipedia article where I got the picture is that there's a few people out there who keep them as pets. They're only toxic if they eat a lot of toxic ants in their native habitat, so if you wanted, I suppose you could put the real thing in your sister's room. You'd have to be careful about where you put it, though, since they're pretty tiny (most are about the size of a thumbnail, says the article). I don't really have a general bromeliad page, so this works as well as anywhere. 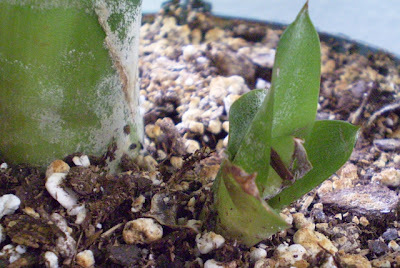 Different genera of bromeliad offset differently. With Vriesea splendens and some of the Neoregelias, it seems to work best to just let them do what they want to do and not separate the offsets. I've never seen an Aechmea produce offsets from between the leaves, so I'm having trouble picturing what you're describing. Is there any chance you could e-mail a photo?